It is the transparent intelligence of our daily life, where technology is integrated with entertainment, business, leadership, education, health care, communication, science, arts, and sports; information technology has changed practically every aspect of our lives. Where information technology is needed, academically educated IT experts are needed as well. Here in the Faculty of Information Technology at the University of Jyväskylä, we train versatile IT experts for the needs of today as well as for the future. 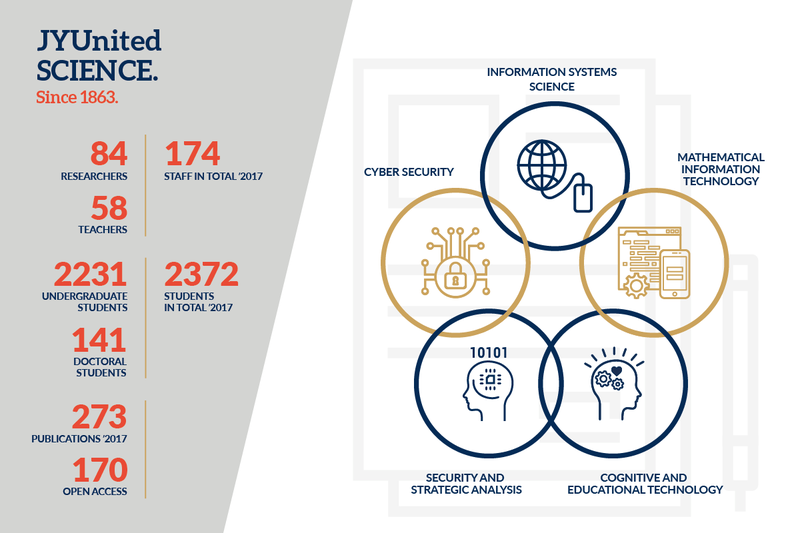 The Faculty currently invests in creating concentrations of top know-how in the following thematic areas: data systems, scientific computing and data analysis, cyber-security, entertainment, games, and learning. Come and acquaint yourself with the Faculty of Information Technology, and update your knowledge on information technology and IT studies. Teaching and research in Information Systems Science focus on key areas of information technology, such as the development of information systems, digital presentation of information, electronic business, communication between human and computer, application and adoption of technology in daily tasks, intensification of work groups and organisations using information systems, data management, software business, and development and management of systems architectures in organisations as well as data administration. The MSc (Econ) degree in that connects studies in IT and economic sciences is unique in Finland. The profile areas of teaching and research are related to key areas of information technology, such as design and execution of software, invocation of information technology in education, design and management of transmission systems in information networks, and application of numerical and mathematical methods and models that utilise efficient computer calculation in, for example, analysing large amounts of data. Cognitive Science is an interdisciplinary field of study that combines different anthropological and technical subjects. Its research subjects are the mind, experience, thinking and intelligence. It is affected by fields such as computer science, psychology, philosophy, sociology, anthropology, linguistics, artificial intelligence, neuroscience, design research, and arts and culture. The functioning of the modern network society rests upon the functionality of different data systems and information networks in cyberspace. Even small disruptions may cause significant problems in, for instance, logistics, economy and the security of our society. In fault situations, for example, crucial infrastructure and payment systems may be threatened. Understanding the cyberspace and managing related threats require novel, multidisciplinary expertise that combines, for instance, information security, continuity management and the preparation of the society for various crises. Cyber security has, indeed, become a key field in many professions.